Torrid Technologies, Inc., a company based out of Marietta, Georgia, has recently released the 2016 version of their award-winning Retirement View software for Windows. The new version includes all of the award-winning capabilities of its predecessor, with some additional improvements. The software has been in circulation and consistently updated since 1995, and is reported as being used regularly by a number of major broker dealers, and financial advising firms. Currently, the Torrid Technologies, Inc. team is providing access to a free demo of the software from the company’s website at http://www.torrid-tech.com. The tool is described as being easy to use, easy to learn, and uses a simple fill-in-the-blank system. It works quickly, processing accurate retirement saving plans in less than 15 minutes. 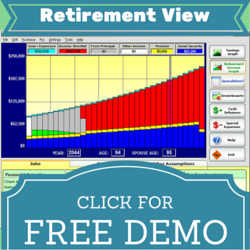 The Retirement View software for Windows can be downloaded directly from the Torrid Technologies site for both individuals and businesses. From there, potential users of the software can read the reviews of current customers, speak to a member of the team or view other products and services offered through the company. A unique video tour of the capabilities of the 2016 software release is also available through the website, providing some insight into the upgrades and additional content which users can benefit from during the retirement planning process. This walks users through entering data such as Social Security, Pensions, investments, benefits, special expenses, and other cash disbursements. It also shows why using a basic online calculator for this type of planning is inefficient. Price varies between the personal edition, couple’s edition, and professional edition, but both offer the same colorful graphics, real-time experience, and uncomplicated process to provide users with effortless planning potential. The company invites interested parties to download the trial version and see for themselves. Marietta, GA, November 17, 2014 – Torrid Technologies has thrown its hat into the online advisory platform business competing with large financial companies and others using advanced technology integrated with a competing custodian. It is very clear that the online advisory business is growing and here to stay. The Torrid Advisory Solutions SaaS Platform competes with pure electronic “Robo-Advisors” by helping existing advisors extend their practices to the “cloud” with ease. This new “Cloud-Advisor” model shines a light on the “Robo-Advisor” shortcomings, which are mainly a lack of human interaction and guidance. The Torrid Advisory Solutions SaaS Platform changes the game for advisors looking to leverage the technologies needed to compete with existing solutions and leap over the competition. The service is immediately available for white labeling by Registered Investment Advisors (RIAs) and advisory firms. As Tim Turner, CEO of Torrid Technologies shared, “Most robo-advisors are simply low-cost portfolio management solutions that rely totally on computer-based decision making.” One robo-advisor firm, for example, has gathered over $1 billion in assets since 2012. Unlike such pure “robo-advisors”, Torrid Advisory Solutions is different because it provides a Financial Advisor or Investment Advisory firm the ability to extend their existing financial practice to the cloud. Doing business in the cloud shouldn’t represent a reduction in services in order to reduce cost. Torrid Advisory Solutions believes “bringing an Advisor’s business to the cloud” means increasing scalability while increasing efficiency and automation, so that an Advisor can manage a business growing without borders. At the heart of the Torrid Advisory Solutions SaaS Platforms is “video”. Whether it is an Investment Advisor looking to share their portfolio management decisions with investors, or a financial advisor performing a video consultation with a client, integrated video conferencing and video communication makes the cloud feel a little closer. Providing Advisory Services is a consultative business and without integrated video, “Robo-Advisors” are little more than a computer program. rebalancing and simplified portfolio management all without the advisor having to do anything to make a trade. But the icing on the cake is the robust client communications layer. Client’s will never feel left out in the cold with the real-time notifications of portfolio changes (including video explanations), and any other pertinent information shared by the advisor. Combined with Social Media integration, clients and advisors can participate in discussion threads that reach the masses with personal interactions. The Torrid Advisory Solutions SaaS Platform competes with pure electronic “Robo-Advisors” by helping existing advisors extend their practices to the “cloud” without much effort. a This new “Cloud-Advisor” model shines a light on the “Robo-Advisor” shortcomings, which are mainly a lack of human interaction and guidance. Torrid Technologies RetirementView software is used by thousands of customers including agents, advisors, planners and brokers This top-rated software for both consumers and financial advisors has been seen and reviewed favorably in Forbes, Barron’s, BusinessWeek, Reader’s Digest, USA Today, among many others. Torrid Advisory Solutions is a service of Torrid Technologies, Inc.
Straight from the IRS:: Under the new IRS guidance, a target date fund may include annuities allowing payments, beginning either immediately after retirement or at a later time, as part of its fixed income investments, even if the funds containing the annuities are limited to employees over a specified age. The guidance makes clear that plans have the option to offer target date funds that include such annuity contracts either as a default or as a regular investment alternative. The new policy change is another step reflecting the continuing commitment of the Administration to work in a variety of ways to further bolster retirement security and saving. Torrid Tech Explains: This means that the employer plans have the flexibility to offer the annuity as an option or as a default when employees save into their 401(k) plan. Afraid you may outlive your savings; tried giving annuity options a try? Share your feedback. We’d love to hear from you! Torrid Technologies, a retirement planning software company, breaks down the government financial technobabble and explains to advisors how new U.S. Department of the Treasury and Internal Revenue Service policy changes allow them to increase their client’s annuities and why consumers should consider this option. Marietta, GA, November 8, 2014 – Recently, the U.S. Department of Treasury and Internal Revenue Service confirmed a new policy change with a goal “to help retirees manage their savings and ensure they have a stream of regular income throughout retirement”. This is good news for financial advisors, professionals and consumers alike. And to better explain the options available, Torrid Technologies has outlined their top 5 Need-to-Know points from the policy, how the changes allow advisors to increase their client’s annuities and why consumers should consider the option to purchase annuities more readily. Torrid Tech’s Explanation: Employees saving in their 401(k) plan at work can choose annuities from insurance companies inside their 401(k) plan so they can reduce market losses on their retirement savings by putting their savings into annuities, instead of mutual funds or target date funds. Many employer-sponsored 401(k) plans offer so-called target date funds as a default investment for participants who do not affirmatively elect a different investment. Target date funds get their name from the fact that their allocation of investments shifts gradually from equities to fixed income as participants approach an intended target retirement year. Torrid Tech’s Explanation: In recent years target date funds have exploded in popularity by offering workers a way to reduce risk in the market as they approach retirement. Recent abnormal bond pricing has made it difficult to achieve this result and has left many wondering whether target date funds are accomplishing their goal. The new guidance or policy provides plan sponsors an additional option to make it easier for employees to consider using lifetime income. Instead of having to devote all of their account balance to annuities, employees use a portion of their savings to purchase guaranteed income for life while retaining other savings in other investments. Torrid Tech’s Explanation: This means the employee can choose to put some into annuities for lifetime income and still also have savings in other investments like mutual funds. Under the guidance released a few weeks ago, a target date fund may include annuities allowing payments, beginning either immediately after retirement or at a later time, as part of its fixed income investments, even if the funds containing the annuities are limited to employees over a specified age. The guidance makes clear that plans have the option to offer target date funds that include such annuity contracts either as a default or as a regular investment alternative. Torrid Tech’s Explanation: This means that the employer plans have the flexibility to offer the annuity as an option or as a default when employees save into their 401(k) plan. In an accompanying letter, the Department of Labor also confirmed that target date funds serving as default investment alternatives may include annuities among their fixed income investments. The letter also describes how ERISA fiduciary standards can be satisfied when a plan sponsor appoints an investment manager that selects the annuity contracts and annuity provider to pay the lifetime income. Torrid Tech’s Explanation: This repeats the idea the annuities can be included as part of the fixed income portion of target date funds and that a plan can meet its fiduciary standards by having an investment manager selecting which annuity options are offered. In July, the Treasury Department and IRS issued final rules on the use of longevity annuities – a type of deferred income annuity that begins at an advanced age – in 401(k) plans and IRAs as part of a broader coordinated effort with the Department of Labor to encourage lifetime income and enhance retirement security. What does this mean for you? The new policy change is another step reflecting the continuing commitment of the Administration to work in a variety of ways to further bolster retirement security and saving. Last week the Senior Citizens League released an article demanding a higher COLA in response to the Social Security Administration’s announcement of a 1.7% increase in benefits for retirees. About $113 Missing from Social Security in 2015, Says The Senior Citizens League. Only a day after Social Security announced a 1.7 percent cost-of-living increase for beneficiaries in 2015, The Senior Citizens League is calling for a minimum increase of 3 percent, which was the average before 2010. The group’s leader, Ed Cates, says benefits of the typical Social Security recipient will be about $5,298 lower by the end of 2015 due to the government not maintaining at least a 3 percent increase. Are your a senior? Do you agree? Share your feedback. We’d love to hear from you! Here’s some great news for retirees on fixed budgets that are often stretched by medical expenses. Monthly premiums for Medicare Part B and the related deductible for 2015 will remain the same as in 2013 and 2014, according to a recent announcement from the U.S. Department of Health & Human Services (HHS). It means retirees won’t have to spend any of the latest cost of living increase (COLA) in Social Security benefits — a 1.7 percent rise — on higher Medicare premiums. Here Steve Vernon outlines the latest about Medicare and it’s relation to the most recent COLA developments. In what ways have you spent your COLA in the past? Do you spend it on medical costs? Share your feedback. We’d love to hear from you! The question is whether they can turn that nothing into something. How much of a percentage increase in COLA would you like to see? Have you noticed or paid much attention to this retirement need-to-know in the past? Share your feedback. We’d love to hear from you!